9 Nov 2018, 11:19 a.m. The current expectation is that the UK will have 1.3% GDP growth by the end of this year, slowing to 1.2% for the next two years. This is down from the 1.7% growth in 2017 and accounts for the expected Eurozone slowdown for growth. The EC’s reasoning is that consumer spending growth will continue to be marginal, on top of the sub-par business investment due to Brexit concerns, and the border issues will also hinder the demand for UK exports. 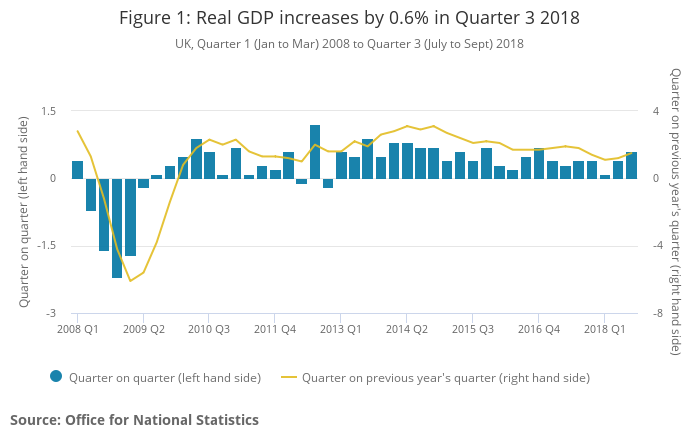 The Office for National Statistics published GDP figures today, seen in the graphic below, which shows the UK grew by 0.6% in the third quarter to hit 1.5% growth year-on-year. The slowdown in the automotive sector and construction as the year concludes is likely to bring this growth neatly to the 1.3% that all parties have forecast, but the growth puts the UK ahead of the Eurozone average of 0.2% for the summer, and slightly behind the USA’s 0.9%. In the wake of the European Commission’s figures being released, Labour MP for Tottenham, David Lammy tweeted that “Brexit is turning Britain into the sick man of Europe” while Steve Hawkes, Deputy Political Editor at The Sun joked the UK at the bottom of the table was “Like Eurovision all over again!”. Another area of weakness is considered to be the shortage of labour supply, again attributed to the border restrictions and access permissions, with both the UK and EU suffering as they lose access to one another’s jobseekers. The European Commission’s report is flawed, however, by an absence of the latest Office for Budget Responsibility data. The OBR forecast for 2018 growth matches the EC’s 1.3%, but the organisation believes GDP will rise by 1.6% next year and then fall off to 1.4% in 2020. The OBR has an advantage over the EC too in that the organisation was informed of Philip Hammond’s budget plans in time for its forecasts, whereas the European Commission was not. Even if the UK were to languish with 1.2% GDP growth for the next couple of years, there’s much more to come from the Brussels vs Rome dispute currently ongoing, with the International Monetary Fund now weighing into the war of words between Italy’s coalition government and the European Central Bank. The IMF believe the EC has underestimated Italy’s poor economy and that Italy, not the UK, will sit at the foot of the growth charts. Furthermore, the IMF and ECB see the lack of growth meaning that Italy’s debt holdings will be higher than the EU allows, which is driving the latest round of calls for Italy to re-draft its budget and prioritise debt repayment ahead of public spending. The deadline for a new budget submission to the ECB is next Tuesday but given the current opposition to making amendments it will be a surprise if Italy concedes and the government breaks election promises. You can read the full Q3 2018 report from the Office for National Statistics here.